Stone Plague Cleaner is a water-based cleaning agent for cleaning and removing algae and lichen from exterior pavers - quite commonly refered to as Black Spot. 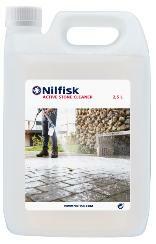 Application with a Nilfisk Foam Sprayer. Coverage: Approx 125 m2 per 2½ litres Stone Plague Cleaner is an efficient detergent for removing any unwanted dirt, algae and lichens from the exterior pavers. Always test on a small area to make sure the surface tolerates the cleaning detergent. Packaging may be recycled in accordance with local regulations. A biodegradable surface cleaner in accordance with EU legislation. Store in a frost-free place.